It's a fact. My kids are wiggle worms. So putting sunscreen on them while they are making a bee-line for the pool is no easy feat. Applicaion needs to be quick, comprehensive and make as little mess as possible. Enter the Swim Goggle and Spray Sunscreen! 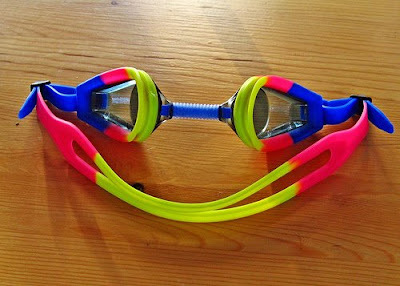 I have the kids put their goggles on before the sunscreen and I spray them from head to toe! That way, I don't have to worry about getting it in their eyes. Once I'm done, I touch up the under eye area if needed! Presto! Full Coverage. No Mess. No Burning Eyes. What a great idea! We often get sunscreen in or way to close so someone is screaming :) Enjoy your weekend! That's a clever idea. My boys are all about goggles lol. Michelle, that is a seriously great idea! You should send that to Asha to post on Parent Hacks. Thank you. Joanh Lisa, I sent it to ahsa just this morning! @babyblooze on twitter inspired me to post about the tip and also said I should submit it! Thanks so much for your kind words! I will be doing this for sure. Thanks for the great tip!! Maybe there could be a pre-swim trial before leaving the house - swim suit on, googles on, spray! this is genius. brilliant. there aren't good enough words to describe this. it's scrumtrellescent. Great tip. I'm going to pass these on to my Mommy friends!